Plantar fasciitis is an inflammation of the plantar fascia, a flat tendon stretched on the base of your foot, from your heel to the base of your toes. A few decades ago, plantar fasciitis was considered (and treated) as a chronic inflammation, but nowadays there’s a tendency to approach it like a complex of degenerative changes—inflammation being just one of them. The plantar fascia plays a crucial role in distributing the weight of your body throughout your feet in the best way possible. When this structure in your foot gets inflamed, not only does it make every step excruciatingly painful, but generally impairs the physics of how you walk, run, and even stand, thus contributing to a faster wearing down of your body. All in all, plantar fasciitis is an incredibly common condition: some studies affirm that about 1 in 10 people will develop the condition in their lifetime. There is no universal opinion on what exactly causes plantar fasciitis. This condition presents with quite a bit of different changes in the plantar tendon, and not all of them are inflammatory. A healthy non-inflamed plantar fascia acts like a shock absorber. When too much force or pressure is applied, or for a long time, the fascia can rupture, become stiff, and stop absorbing shock effectively. This inflammation then may progress onto the bones and surrounding connective tissue: such is the most popular opinion on what causes plantar fasciitis. In many cases, however, the cause of plantar fasciitis isn’t obvious. Although we don’t know the exact and universal cause of plantar fasciitis, several contributing factors were confirmed over the years. High-impact sports: Putting too much strain on your foot is a great risk factor for all sorts of foot traumas and conditions, that’s why plantar fasciitis is so common among athletes. Dancers are also at risk, especially ballerinas since many of their dancing positions are quite strenuous to the plantar fascia. Overweight: Excess weight is another way of putting too much strain on your feet: the more the body weight, the more the risk of developing plantar fasciitis. Losing weight decreases the severity of plantar fasciitis symptoms in many cases. Excessive standing: Certain professions have a higher risk of developing plantar fasciitis since most of the time is spent standing. For example, we’re talking about hairdressers, surgeons, everyone who stands for hours on end, and day after day. Posture and gait problems: Back problems like scoliosis, or having even a slight difference in legs length, are some other contributing factors to the development of plantar fasciitis. They lead to an uneven distribution of your body weight between your feet, making one foot more likely to suffer from plantar fasciitis. Flat feet: Flat feet are another independent risk factor for plantar fasciitis because this condition makes the feet unable to absorb and distribute shock properly, meaning they are more likely to suffer from micro-ruptures and traumas of the plantar fascia. Decades later, the cumulative damage may lead to plantar fasciitis. Injury: Traumas to the heel and/or to your toes can also increase your risk of getting plantar fasciitis since that’s where the fascia attaches. Inflammatory conditions: Local inflammatory processes like rheumatoid arthritis or gout can eventually damage the plantar fascia and thus start plantar fasciitis. Gender and age: Statistically, women are more likely to get plantar fasciitis, and age after 40 is another contributing risk factor (possibly due to age-related changes in the tendons). It’s worse immediately after rest. For example, plantar fasciitis sufferers experience a sharp episode of pain during their first steps in the morning or immediately after getting up from sitting for a long time. After the initial episode, 10-15 minutes of walking usually make the pain less severe. In 70% of the cases, the pain is unilateral (in one foot). In rare cases, the pain can be accompanied by swelling, numbness, or a tingling sensation in the foot but this is rare, and should be examined separately since it may indicate damage to the local nerves. Another recommended approach is deep tissue massage or self-massage, but this has to be approached carefully to not over-stimulate the inflamed tissues. When nothing helps and the situation keeps worsening, the fascia is removed surgically to prevent further spreading of inflammation and continuous suffering. Since you are reading this, chances are you have decided that you do not wish to take harmful drugs and injections as treatments for the pain you’re experiencing. 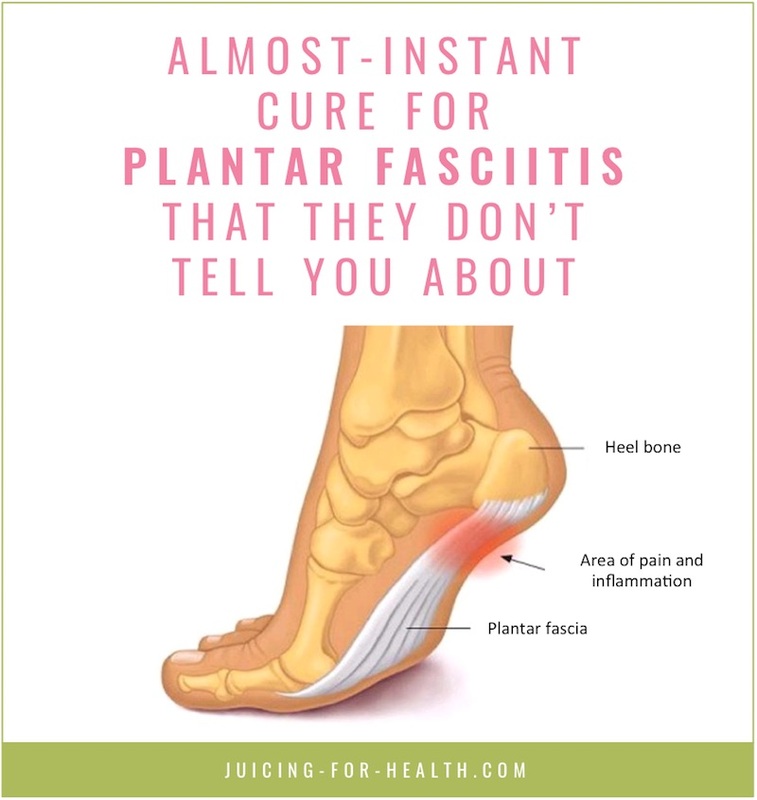 Most of the information on the internet about plantar fasciitis is repetition of the same remedies, many of which may not have worked for you. General practitioners are not prepared to treat plantar fasciitis, and often resort to prescribing anti-inflammatory or painkillers. First of all, take time off from the repetitive movements that cause the condition in the first place. If your daily occupation requires you to stand for hours on end, day after day, then take a rest. It will do you no good to continue aggravating the pain in your feet. Plantar fasciitis is an inflammation on the base of your foot. So, it makes sense to stop eating foods that cause or aggravate inflammation. Here is a list of 20 most offensive foods that can prevent you from getting better. Some people will notice improvement by simply eliminating these foods from their diet. Instead, eat whole and natural foods that are rich with anti-inflammatory properties. This pineapple smoothie is an excellent beverage that helps to reduce inflammation. Bromelain in pineapple is a natural painkiller. Alternatively, you can take Bromelain in supplement form. Devil’s Claw is another recommended anti-inflammatory. The beauty with these supplements is that they not only relieve pain, but also helps accelerate the healing; unlike painkillers that you buy from the drug store, such as Tylenol that only suppresses pain and causes side effects. Wearing the wrong type of shoes for long periods can, over time, make the feet muscles weak and unable to support the arch of the foot, leading to plantar fasciitis. So, it makes sense to shed footwear whenever possible to regain a strong foot core. If you have pain, slowly easing into walking barefoot may help. First try walking on the smooth floor at home or in your office. Walking barefoot on a wet sandy beach where the sea water comes in, is one of the most healing activity you can do, if you have plantar fasciitis. It is healing to the soul, it is relaxing, it gently stimulates the inflamed nerve endings and heal them with the salt water minerals, and the earthing effect also helps relieve inflammation. If you have no access to the beach, try walking barefoot on grass or soil in your backyard. It gives much relief to the inflammation on your feet as well. This should be one of the first things you try, if you have plantar fasciitis. According to Dr Eric Berg, the stretching exercises most practitioners teach take too long to heal. Dr Eric Berg, a chiropractor who specializes in weight loss through nutritional and natural methods, shares this shortcut and almost-instant cure for plantar fasciitis. In this video, Dr Berg shows how to perform a simple stretch by using the principle of opposites. Anytime a muscle is tight or inflamed, work on the opposite, not the involved area. Judging from over a thousand very positive comments below the video, I can only say that this technique works miraculously! Reflexology is a massage technique used on various points on the top, bottom, sides and toes of the feet to relieve tension, improve circulation and heal the body. The technique is quite amazing for relaxing the flow of subtle energy through the meridian points. In our body, a system of nerves run vertically down the front and up the back of the body. They are the reflex channels that connect to all the organs, glands and tissues of the human body. Some of the channels turn around at the feet, which is why the action of pressing in this area stimulates and move along ultra-microscopic energy through the entire length of the body. When an area of the foot is hard and tender, it usually needs a gentle but firm massage to rub away the pain. Massaging for 2-3 minutes each time, no more than three times a day, is usually helpful for relief. Always use blunt reflexology tools, never sharp objects. A foot roller is a useful tool that you can use without having to depend on a reflexologist. Place it on your foot, simply roll and applying enough pressure. This Theraflow Foot Masssager Roller is designed to target trigger points in the foot arch, heels for firm kneading that stimulates and relaxes. After massaging with a foot massager roller, put on a snug pair of compression foot sleeves. Users have reported an immediate relief and making the pain more bearable. Foot sleeves can be worn during the day and even while sleeping. The pressure from these sleeves pushes your lymph fluid up the leg, helps your blood to flow better from the legs to the heart. It helps your muscles relax, improve blood flow, reduce swelling and pain. With better blood flow, inflammation can be reduced, allowing your feet to recover faster from pain. After wearing compression foot sleeves for some time, you will find an improvement even when not wearing them. The key is to wear fitting sleeves that are the right size for your feet. They have to fit snugly without creases when worn. It is important to get a pair of quality compression foot sleeves that are form-fitting, durable, lightweight, provide optimum support and made of breathable fabric. 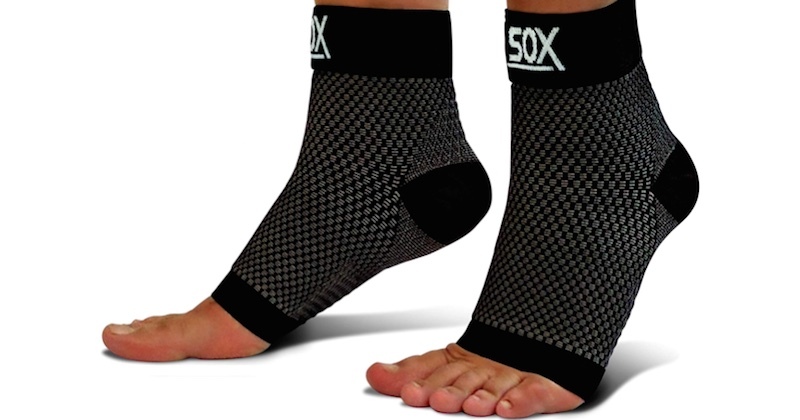 You can get SB Sox Compression Foot Sleeves that fit the description of the ideal compression socks/sleeves that work effectively, here. A foot bath soak is very useful and easy for relieving foot pain. It not only helps relax the muscles in your feet, but also the fascia tissue. Ancient cultures have used water from hot springs to relieve or cure many ailments. Hot water helps to relax muscles, ease stress and strain, and promote circulation for better health. As the spring water flows from under the earth, it is often also rich in minerals. People dipping in the water have found the water to be healing for many ailments. An interesting note though, the water from hot springs are not boiling hot, they are very warm. The water temperature should be a little warmer than your body’s internal temperature but not too much more. Just about ±102° is best (use a thermometer to check). If it’s too hot, it raises your blood pressure and puts a strain on your heart. I recommend doing toe curls and foot stretches while your feet are in the water. Epsom salt is rich in both magnesium and sulfate. While both of these minerals are poorly absorbed through your diet, studies show an increase in magnesium level from soaking in a bath that is enriched with Epsom salt, without any adverse effects! Magnesium alone is a miraculous mineral to have in adequate amounts in the body. The sulfates in Epsom salt help to pull out harmful toxins from the body through the skin. I come across many people who suffer from plantar fasciitis for an unnecessary long time before they find any relief or healing. Most of them have many sessions of physiotherapy yet do not find much improvement. By resting your feet as appropriate, eating better and applying a few of the above methods, I trust that you will soon find relief and even stop the pain completely.